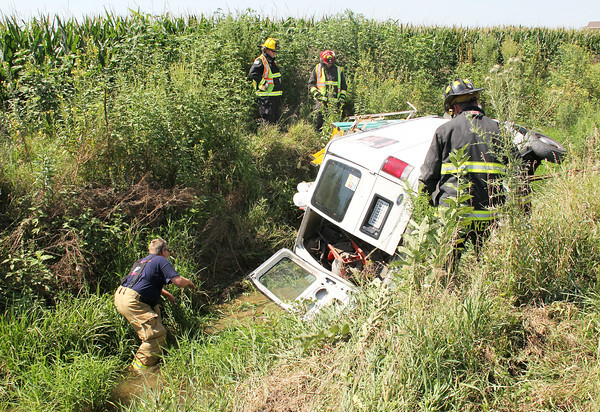 ABANDONED IN A DITCH: A van resgistered to Mike Gregory Plumbing, 8320 N Burg Avenue, Kirklin, was found Monday afternoon overturned in a 12-feet-deep ditch on the west side of Victor Road, just north of Indiana 47. The driver left the vehicle. A wrecker from DeVol & Son lifted the van so rescuers could ensure the drive was not trapped, and then pulled the wreckage out of the ditch. Units from Lebanon and Center Township fire departments, Boone County EMS and the Boone County Sheriff's Office responded.